Heart-Shaped Makeup Stick Packaging – Cosmetics Packaging Supplier | Fancy & Trend Enterprise Co., Ltd. The two new heart-shaped stick packaging that are built for cosmetic products can be featured as blusher, makeup foundation, and lipstick. Both packaging components are made of ABS, a plastic type that has been vastly utilized for most commodities that required exquisite decoration and surface treatment. It features a push-up mechanism, and requires hot-pouring filled from the top of the reservoir. This packaging type is mostly used for blusher, concealer, or makeup foundation. 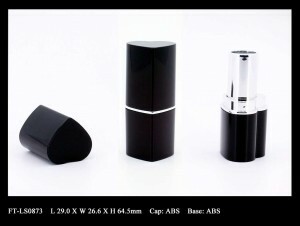 It adopts a standard lipstick bullet barrel to hold product.